Kanzemer Alternberg is another very famous vineyard of Germany. 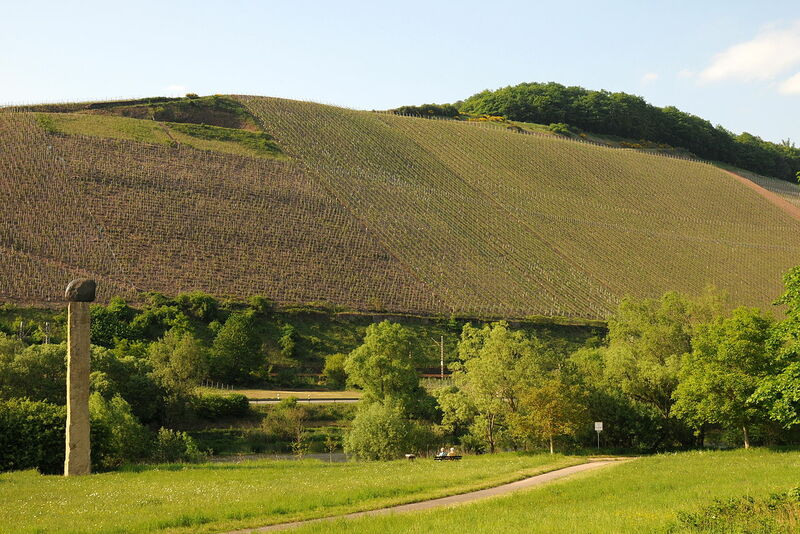 Is a very steep (up to 80% grad) hill in the opposite of a village called Kanzem on the river Saar. Similar to other vineyards in this area the soil is schist with some minor portion of clay and silt. Due its location – it faces to the south – it absorbs and stores the warmness of each sunny day although the river causes a stability of any variability of temperatures. At this hill you can find only the grape sort Riesling. The outcome is fantastic wine, rich of delicate aromas of apricot, peach, lemon and quince, along with an impressive minerality which even is a little bit salty and petrol. This wine is in certain regards condimental, you image to smell and taste the sommer of the little valley – herbs and stone. The echo is strong and keeps very long. Maybe it is so enjoyable as it comes along light and clean, certainly less heavier than some other Grand Cru Rieslings from some other but still close areas. The lightness does not mean sourness! 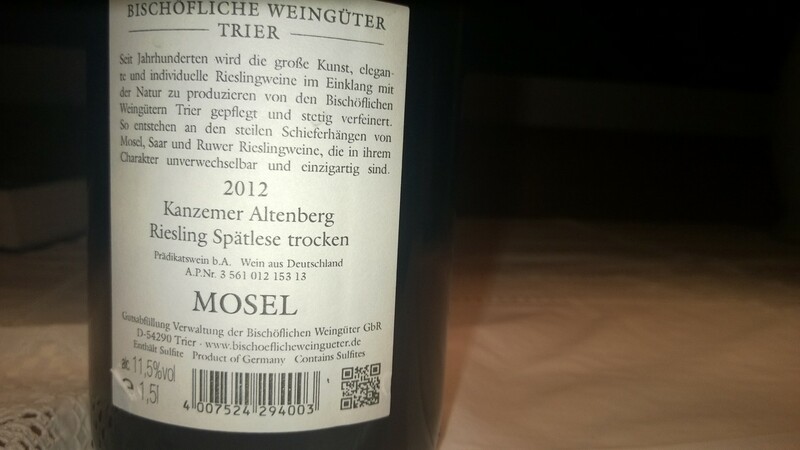 Since I reported already about the winemaker I like to lead your attention to my previous reviews: https://avdwineandfood.wordpress.com/2015/05/22/ayler-kupp-riesling-auslese-2012-bischofliche-weinguter-trier/ and https://avdwineandfood.wordpress.com/2015/06/07/kaseler-nieschen-riesling-spatlese-trocken-2012-bischofliche-weinguter-trier/. The bottle I had was a magnum, so perhaps one more reason why this wine was so delicious. And 2012 was a very good vintage of all wine from Mosel. You could easily store such a wine many years! Their wines have become better and better…glad to hear.